If you are like myself and struggle with natural hair, you might find it difficult to find styles that work for you. Before I began my natural hair journey I was a little skeptical about the whole process. Once I went ahead with my big chop and cut all the relaxer from hair I was stuck. I was happy that I finally moved forward but now I had no idea what to do with my hair. I went online and did plenty of research to get a better idea on styles that would suit my features. I felt like I was making progress but yet I was still lost. Finally I got my hair tools out and started to work on my hair. The twist out method was my first attempt doing a natural style. 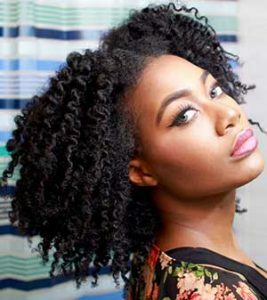 The twist out method is simply two strand twists that are unwrapped after being set. One they are un-wrapped you end up having a curly finish. This style if done correctly will last up to two weeks. The style can be kept for a longer period of time if it is re-twisted at night. 1. Pre-wash your hair before you start. You should do this with a Sulfate free, hydrating, or clarifying shampoo. Make sure that the hair is clean and there is no product buildup. 2. Use your fingers to part through your hair. This will ensure less manipulation, tugging and pulling. Start by separating the hair down the middle first, then across the crown from ear to ear. This will give you four large sections of hair more sections can be used on thicker hair. You can clip the hair back or make a braid to secure the section. 3. De-tangle the hair. If the hair is dry use a spray bottle to wet the hair and detangle. (A spray bottle with a water and conditioner mixture can also be used.) Start De-tangling from the ends working your way up towards the roots. When doing this be sure to check for any shed hair, tangles, or knots. Additional sections can be used as well for hair control. 4. Deep condition hair and towel dry leaving the hair slightly damp. Heat can be used but not necessary. 5. Twist small sections by wrapping one strand of hair around the other. Use moisturizer while doing this to lock in moisture, making sure the hair does not dry out. Wrap the completed twist around into Bantu knots to keep the hair stretched. Repeat this until the whole head is completed. 7. Tie your hair down with a satin scarf to protect the style. This will help keep the style intact. 8. Remove the pins. NEVER take hair down before it is completely dry! This will allow the hair to set and lock in the style. 9. Unravel twists and finger comb. Once the twists are completely out, style hair as desired.